Celebrations of motherhood have been taking place for many thousands of years. Everyone from the Romans to the ancient Egyptians let their mothers know how much they are appreciated. GRShop tries to keep many popular gift items in stock for quick and easy shipping. Remember shipping is free on most orders over $100. If you are in Victoria, BC, stop by our Gabriel Ross Showroom at 2500 Rock Bay Ave. It is stocked with great gift items, ready to take with you. The Herman Miller Eames Hang It All is a great gift. Although it's fun, it's practical too. It's a cheerful piece that can brighten up a foyer, mud room, bedroom, kitchen, or bathroom. It is available in white, black or multi coloured. Check out our selection of Iittala vases and wine glasses, the Tom Dixon Scent series of candles, the Alessi kettles, including the new white edition. Tom Dixon Fire is the rough scent of smokey, scorched and charred woods. Fusing cypriol oil, guaiac wood, amber and musk to sophisticated effect. Encased in a red/brown mouth-blown glass vessel. Available in medium, large and in a special gift set of all four scents. The Alessi Michael Graves Kettle with that great little bird-shaped whistle is available in blue, black and white. Have fun, use your imagination and remember to make that brunch reservation now. This entry was posted in Uncategorized, Events & Showcases, Accents & Accessories, Holiday & Gift Ideas, Gifts and tagged Iittala, Mother's Day, Iittala Alvar Aalto Vase, Eames Hang It All, Tom Dixon Scent, Tom Dixon Fire, Alessi Michael Graves Kettle on April 27, 2015 by Christine Toller. Don't miss this giant event, Friday, April 24th and Saturday, April 25th, 9 am to 5 pm. Lots of great deals on authentic designer furnishings from Knoll, Moooi, Vitra and many other highly recognized names. 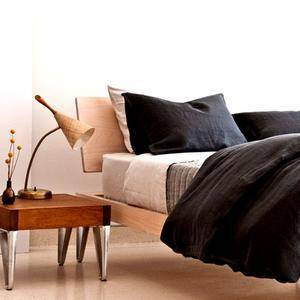 Save up to 80% on a wide selection of furniture and accessories. We will be holding a draw for prizes so don't forget to enter! There is lots of street parking available on Rock Bay Avenue. So let's all hope for a sunny couple of days. Bring the family and enjoy the savings! This entry was posted in Uncategorized, Events & Showcases, Contests & Freebies, Sales and Promotions and tagged gabriel ross warehouse sale, warehouse sale, Annual sale on April 21, 2015 by Christine Toller. Everyone loves inspired outdoor spaces, perfect patios, a "garden room" for relaxation and entertaining. GRShop’s selection of seating, tables, lighting, accessories and other outdoor furniture are perfect for lounging, dining, or just getting away from your busy world. Imagine! The Stromborg Table Collection is available in different size options plus round, square or rectangular options. The rails are available in many exciting colour options. The Stromborg Table Collection, designed for indoor and outdoor use by Daniel Stromborg, 2012, offers clean lines and exciting connections. The signature X- and Y-shaped aluminum rails give the table a subtle but energetic accent. GRShop offers a large variety of outdoor furnishings including Richard Schultz’s 1966 Collection for Knoll, Vitra, Blomus, Kartell, and many other manufacturers giving you great selection, comfort, and refinement. Minimal care with maximum impact is the way to go. The Richard Schultz 1966 Dining Table is available in many table top options and a beautifully curated collection of powder coated frame colours. Shown here with the dining chairs and the loungers, the Richard Schultz's 1966 Outdoor Collection was hailed as "a breath of fresh air" when it was introduced and that accolade still applies today. Richard Schultz cites Queen Anne's Lace as his inspiration for the delicate outdoor Petal Table with its flower-like top sprouting from the elegant pedestal base. Each "petal" expands and contracts independently, ensuring stability in changing weather. The graceful Diamond Chair designed by Harry Bertoia in 1952, is an astounding study in space, form and function by one of the master sculptors of the last century. 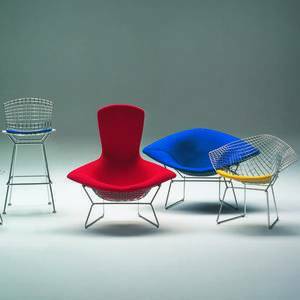 Like Saarinen and Mies, Bertoia found sublime grace in an industrial material, elevating it beyond its normal utility into a work of art. Black and white options are recommended for outdoor use. The Vitra Elephant Stool is one of the most famous post-war Japanese designs and is still as convincing as ever with its clear formal idiom and great functionality. Suitable for balconies and gardens, the stacking stool can even be used as an easy-to-transport picnic stool. Designed by Sori Yanagi, 1954, the Elephant Stool is available in black and cream. Great seating for kids or as a stool while you are gardening. Don't forget the essentials! The Blomus Verdo Watering Can is made of rust-resistant stainless steel and a wooden handle for simple carrying and pouring. So whether you subscribe to the minimalist philosophy of landscape architecture or you love the chaos of a tangled English garden, adding exceptional furnishings to your urban patio or country garden will be a great long term investment in pure relaxation! This entry was posted in Uncategorized, Seating & Chairs, Design & Decorating, Garden & Outdoor and tagged bertoia diamond chair, Vitra Stromborg Table Collection, Knoll Richard Schultz 1966 Outdoor Collection, Vitra Petal Table, Vitra Elephant Stool, Blomus Verdo Watering Can on April 16, 2015 by Christine Toller.